I love trying new beauty products! I am always seeking for new ways to keep my face skin looking nice. 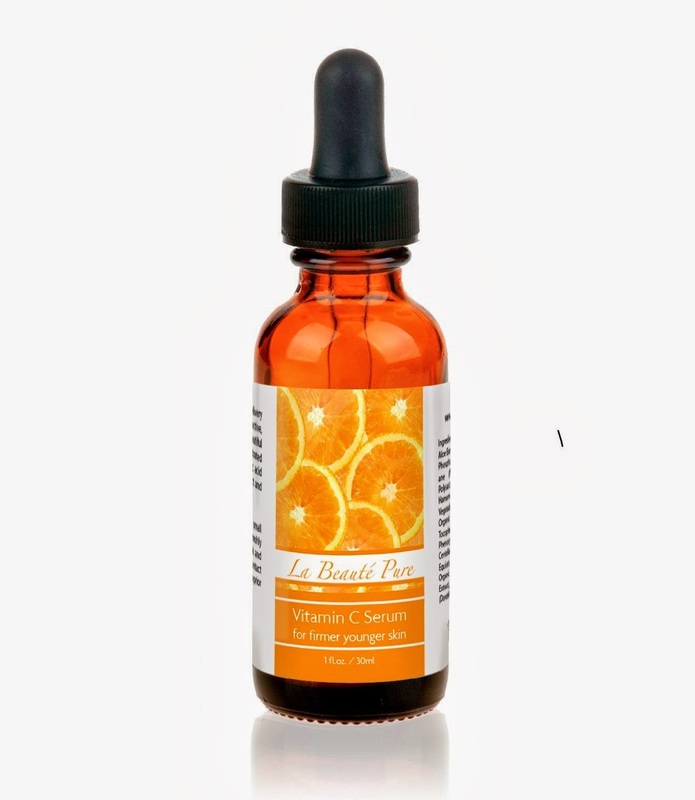 I was excited to give Vitaman C Serum by La Beauté Pure a try. I know vitamin C is a great vitamin that keeps one healthy and helps with healing. I had never know it was also great on the skin. So I was happy to see what Vitamin C Serum could do for my face. -Safer than a chemical peel and cheaper than a facelift. Vitamin C can give similar results. -Applying vitamin C to the skin is up to 20 times more effective than taking it orally. No parabens. No chemicals. No preservatives. No Formalin. No Formaldehyde. No Phthalates. No Petro-chemicals No GMO. No Triclosan. No Fragrance. No Colors. Not tested on animals. 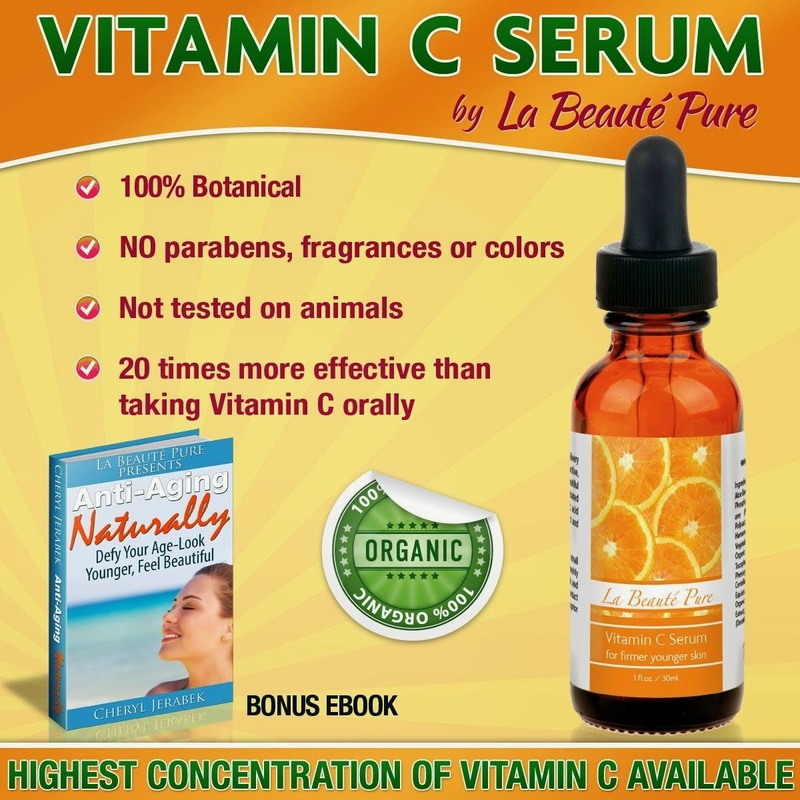 I have been using the Vitamin C Serum for about a week and I like the product. I have been applying the serum to my face at night and letting is absorb for 10 minutes before apply my lotion.While it is too early to notice a change in my skin, I have notice my skin feeling tighter and some fading of dark spots. The serum absorbs well and a little goes a long way. One plus of the product I have noticed is that my fine lines are less noticeable after applying the serum as the Vitamin C plumps the skin. So if I use the product in the morning I have that benefit. I can see a bottle of Vitamin C Serum by La Beauté Pure lasting a month as a little bit goes a long way. So it sounds like you use this in addition to a moisturizer then? I wonder if I could use it to apply at night before going to bed. 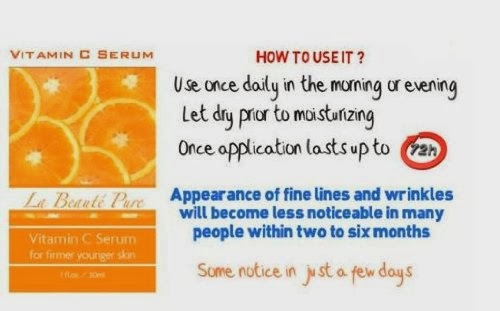 I have been looking into getting a serum. This one sounds great. This is great! I'm tired of chewing the dumb vitamins, so I'll have to look into this! Looks like something I would like to try! I was surprised how much I liked a serum when I tried it. This one looks like a great one. Thanks for the great review. This sounds great, I would have that thought it would have smelled like oranges. ;) But it sounds lovely and seems like it could really help your skin.